My kids absolutely love dramatic play and retelling stories. We read "The Three Little Pigs" a few weeks ago, and since then, they just kept acting it out during their learning labs time. One of my paras made them some pig and wolf masks, and they all had a blast! The next week, our librarian read them Caps for Sale and then had them act it out. Again, my kids just couldn't get enough, and started doing this on their own during learning labs. I decided to make a few cute props to aid in their play. I contacted my go-to clip art person, JolieDesign, and she came up with the fantastic clip art for me. Seriously, if you need clip art for your classroom, hit her up! I am ecstatic with how these turned out! I designed retelling cards to help kids with summarizing or retelling the story in their own words. My students like to hold these up and play teacher with them. They're also helpful after a read-aloud to just show the kids and ask them questions about main events in the story. I also made a sign for the peddler to either wear or display in their center, and masks for the peddler and monkeys. For the hats themselves, I'm giving them beanbags to stack on their heads; it gives them great gross motor practice! Of course, I can't keep a resource this good to myself, so it's listed in my TPT store. 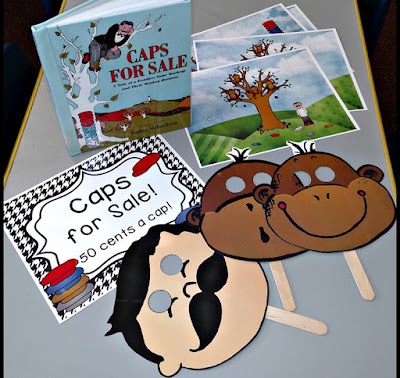 You can find it here: Caps for Sale Retelling Kit and Dramatic Play Center. I hope your students love it as much as mine do, and I would love to hear how you utilize this kit in your classroom!